Assistant Professor Katie Cadwell was selected to attend the National Academy of Engineering’s (NAE) Eighth Frontiers of Engineering Education symposium. It is an event for engineering faculty members who are developing and implementing innovative approaches to engineering education. Cadwell and her fellow attendees were chosen from a highly competitive pool of applicants. “Katie’s dedication to innovative pedagogy, continuous improvement and her students is remarkable. She has transformed two major laboratory courses in our chemical engineering program by challenging her students to work through complex, open-ended, real-world problems. Her students value her emphasis on teamwork, communication skills and problem solving, along with her passion for teaching and learning. 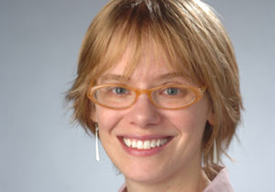 She is a true leader in engineering education at Syracuse University,” says Julie Hasenwinkel, the College of Engineering and Computer Science’s associate dean for student affairs. The Frontiers of Engineering Education symposium is an opportunity for engineering professors to come together to share ideas, and learn from research and best practices. It strengthens U.S. innovation by nurturing and catalyzing the insights of education leaders on today’s 21st century engineering education needs. This year’s symposium was held in Irvine, California, on Sept. 25-28.